Description Olmesartan is an antihypertensive agent which belongs to the class of medicines called angiotensin II receptor antagonists. It acts rapidly to lower high blood pressure. It is marketed worldwide by Daiichi Sankyo, Ltd. and in the United States by Daiichi Sankyo, Inc. and Forest Laboratories. Indication For the treatment of hypertension. Pharmacology Olmesartan, a specific angiotensin II type 1 antagonist, is used alone or with other antihypertensive agents to treat hypertension. Unlike the angiotensin receptor antagonist losartan, olmesartan does not have an active metabolite or possess uricosuric effects. Blockade of the angiotensin II receptor inhibits the negative regulatory feedback of angiotensin II on renin secretion, but the resulting increased plasma renin activity and circulating angiotensin II levels do not overcome the effect of olmesartan on blood pressure. Toxicity Symptoms of overdose include dehydration (dry mouth, excessive thirst, muscle pain or cramps, nausea and vomiting, weakness), dizziness, low blood pressure, and slow or irregular heartbeat. Biotransformation Olmesartan is rapidly and completely bioactivated by ester hydrolysis to olmesartan during absorption from the gastrointestinal tract. There is virtually no further metabolism of olmesartan. Absorption Bioavailability is about 26%. Food does not affect the bioavailability of olmesartan. Protein Binding Highly bound to plasma proteins (99%) and does not penetrate red blood cells. Olmesartan medoxomil (Benicar) is a compound which is hydrolyzed to olmesartan that is a selective AT1 subtype angiotensin II receptor antagonist.Olmesartan medoxomil (Benicar) was converted to olmesartan during absorption from the gastrointestinal tract. Olmesartan is indicated for the treatment of hypertension. It may be used alone or in combination with other antihypertensive agents. Olmesartan medoxomil (Benicar) exerts its pharmacological functions via blocking the binding of angiotensin II to the AT1 receptors in vascular muscle; it is therefore independent of angiotensin II synthesis pathways, unlike ACE inhibitors. By blocking the binding rather than the synthesis of angiotensin II, olmesartan prevents the negative regulatory feedback on renin secretion. As a result of this blockage, olmesartan attenuates vasoconstriction and the secretion of aldosterone. Olmesartan lowers blood pressure by producing vasodilation, and decreasing peripheral resistance. 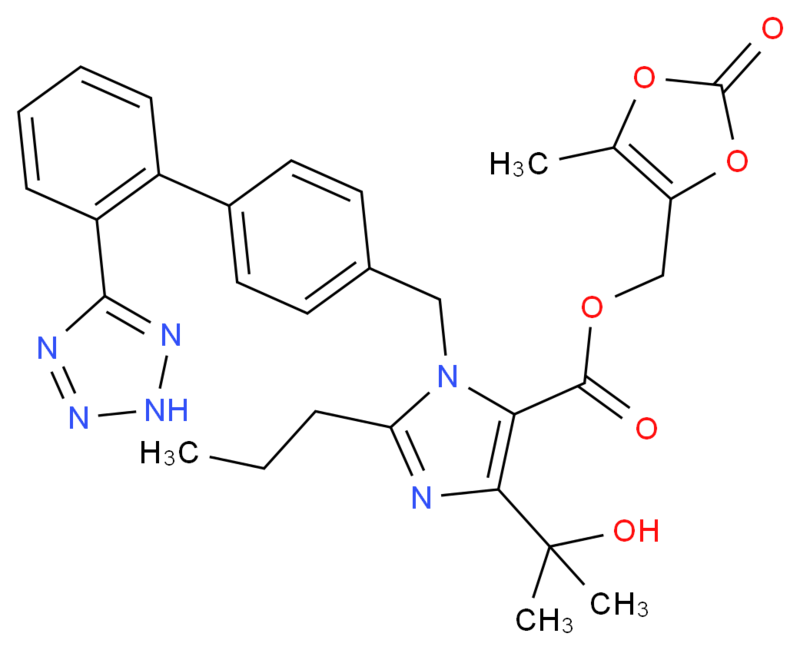 An angiotensin II receptor antagonist. Used as an anti-hypertensive.